“I don’t know this couple but I will like to celebrate them, I celebrate the guy more for his courage,dexterity and greed. When you know what you want,you go for it. If you like fat women go for one, if you like slim girls go for one. Don’t go and marry a fat girl and tell her to slim down or marry a slim girl and be telling her to add some meat. “We are all created by God uniquely and we are the pure image of God. 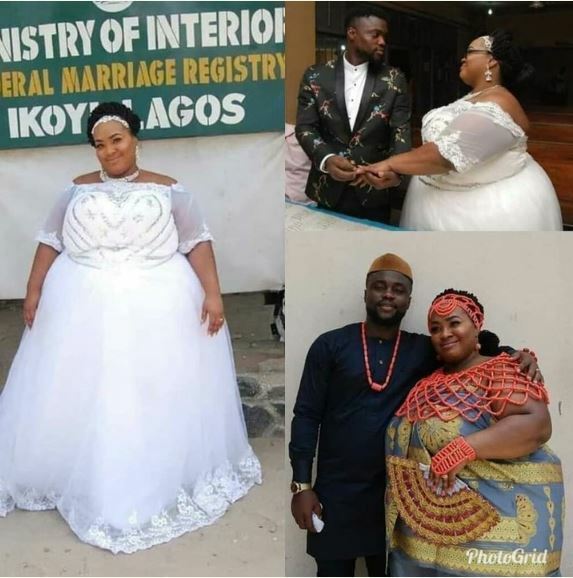 One good thing about getting married to a veeeeeeery fat woman….you won’t be scared that she will soon become fat, she don fat she don fat. Most men that got married to slim girls are living in fear. Thank God that everybody around me know that I love chubby babes with enough padded booth, head lamps and airbags. “Once again congratulations my brother, enjoy your loot…sorry I mean your acquisition, God will bless your home…,” wrote Comedian, Elder O.
Hml to this wonderful couple.